I can be the world's worst procrastinator. Not in making the jewelry but in doing up my post. I remembered about twenty minutes before I needed to get this up that I hadn't written it yet. Hmmmm. Perhaps I can blame it on my memory. 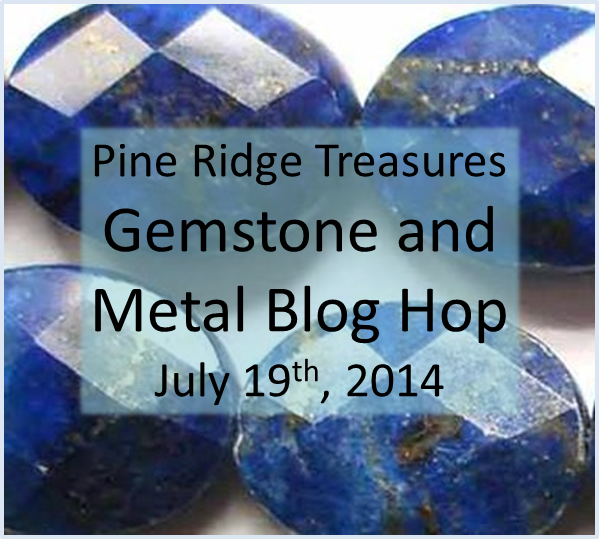 So anyways, I am not going to be as wordy as usual but I did want to thank Lisa Lodge of Pine Ridge Treasures for hosting this hop. This hop caused me to remember just how much I enjoyed working with Jasper. It is such a calming stone and for both necklaces, I just went into a zone where I was playing with the cool stone as I was knotting it up on waxed linen. 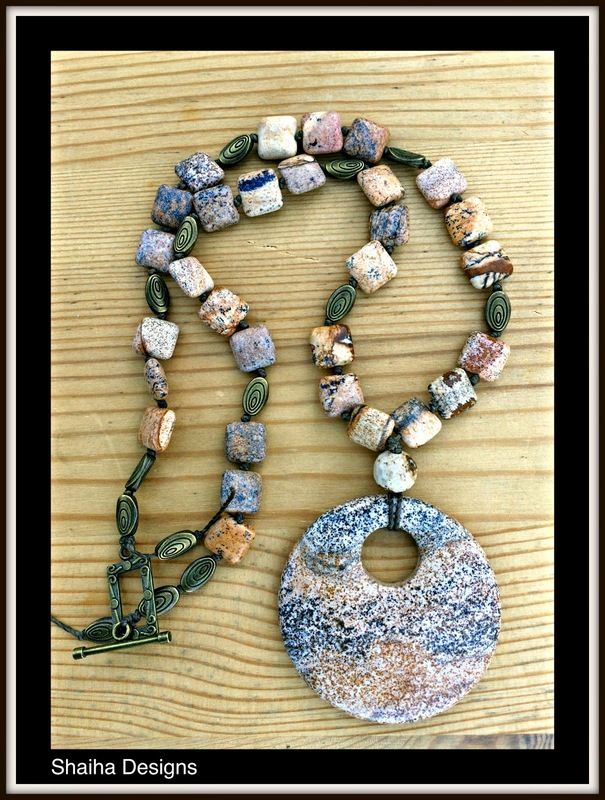 This was the first necklace and all I added to it was the waxed linen and a jasper focal that I have had forever. 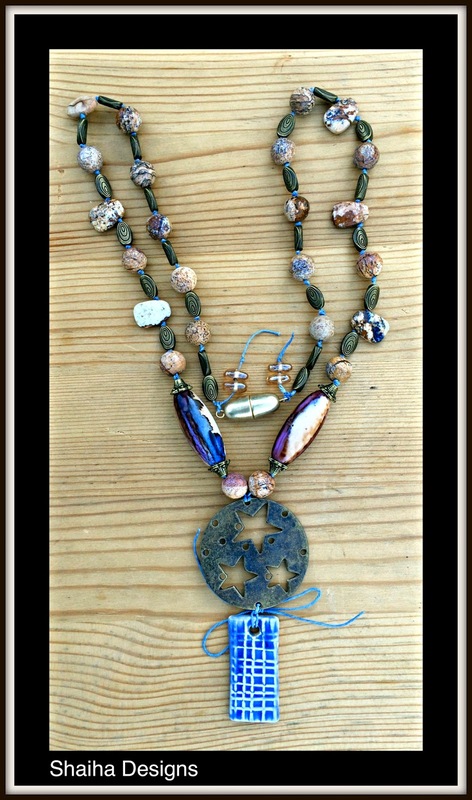 The delightful brass clasp and beads along with the beautiful, earthy Picture Jasper is all from the treasure trove that Lisa sent out. This second necklace was when I was in my own little world and decided to get adventurous. Since I didn't have a ready made focal (or at least one I was happy with), I decided to make one using a brass disc and a smaller ceramic focal. I tied it all together with the Irish waxed linen I was using for knotting. 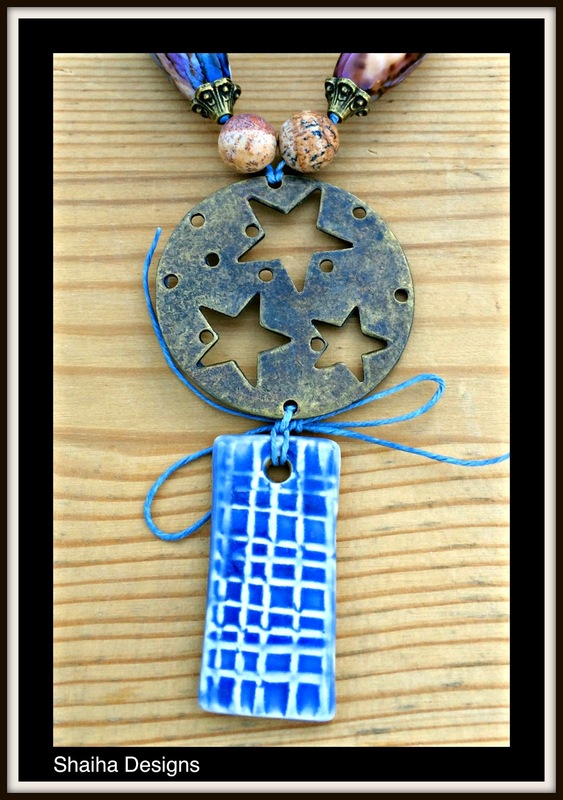 I wanted to pick up the blues that were in some ceramic beads I had added to the mix. See not wordy at all for me. And since you were able to breeze through this post so quickly, you have plenty of time to check out what everyone else has made. I know that I can't wait though tonight is our potluck so I might be a bit delayed. Pretty. I like the jaspers too. I like the focal you whipped up! Great necklaces! I really like the unique focal you made for the second one. The first one really is calming, and the focal you had is perfect. Hi Shai, The focal on the second necklace is beautiful. Good job using the jasper. I really like your first necklace. The focal and beads go together really well. The colors are wonderful. Beautiful pieces, love the focals on both of them. The waxed linen is perfect for the picture jasper. Beautiful necklaces, I especially love the first one. That focal looks like it was really meant to go with those beads. You designed two beautiful pieces, I especially like the first one with the large matching focal, it is both bold and very sophisticated. Both are nice, I like the first necklace the best. I am really enjoying see how waxed linen cord is used, it gives me something to consider using. WOW!!! I love it. This is my first time working with gemstones. I have always stuck with crystals, pearls, seed beads, etc...Now seeing everyone's work I think I may go broke buying gemstones to work with. Incredible piece. I bet it feels GREAT to wear also. I really love your designs! Lots of texture and i love the way it just flows!!! Both of them!!! Have a Blessed Day!!! The focal in the first necklace is amazing. It is perfect in this design. Love the style that you choose! Great designs! Well done. Oh man! that first piece took my breath away - BEAUTIFUL! ooh, the punch of colors really gives this piece class. That first necklace really is soothing. Great job! That has a lovely organic feel. Nice job! Shaiha - I think that your beautiful jewelry is some of my favorite in the whole hop! Earthy, pretty, calming, awesome! The waxed linen looks great. Thanks for being in the hop! They are both really beautiful and I love how you accented the jasper. The second one is my favorite, I think the blue ceramic and the metal star focal just really work so well together. Great job! Your necklaces are beautiful! Your first necklace is gorgeous & I love the colors and focal in your second. Wow...great job! I love the second one and that starry focal! Great job. Thanks for sharing!